UPDATE 7: Here is the Wikipedia Page. Scientists and technicians of the DPRK (North Korea) have succeeded in putting satellite Kwangmyongsong-2, an experimental communications satellite, into orbit by means of carrier rocket Unha-2 under the state’s long-term plan for the development of outer space. Unha-2, which was launched at the Tonghae Satellite Launching Ground in Hwadae County, North Hamgyong Province at 11:20 (3:20 a.m. British time) on April 5, accurately put Kwangmyongsong-2 into its orbit at 11:29:02, nine minutes and two seconds after its launch. The satellite is going round the earth along its elliptic orbit at the angle of inclination of 40.6 degrees at 490 km perigee and 1,426 km apogee. Its cycle is 104 minutes and 12 seconds. Mounted on the satellite are necessary measuring devices and communications apparatuses. The satellite is going round on its routine orbit. It is sending to the earth the melodies of the immortal revolutionary paeans ‘Song of General Kim Il-sung’ and ‘Song of General Kim Jong-il’ and measured information at 470 MHz. By the use of the satellite the relay communications is now underway by UHF frequency band. The satellite is of decisive significance in promoting the scientific researches into the peaceful use of outer space and solving scientific and technological problems for the launch of practical satellites in the future. Carrier rocket Unha-2 has three stages. The carrier rocket and the satellite developed by the indigenous wisdom and technology are the shining results gained in the efforts to develop the nation’s space science and technology on a higher level. The successful satellite launch is symbolic of the leaping advance made in the nation’s space science and technology was conducted against the background of the stirring period when a high-pitched drive for bringing about a fresh great revolutionary surge is under way throughout the country to open the gate to a great prosperous and powerful nation without fail by 2012, the centenary of the birth of President Kim Il-sung, under the far-reaching plan of leader Kim Jong-il. This is powerfully encouraging the Korean people all out in the general advance. 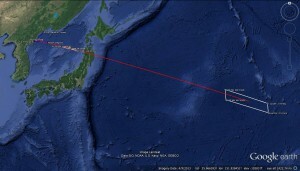 The US and South Korea claim that two of the rocket’s stages and its payload fell into the ocean and that the satellite did not reach orbit. So if we can believe the North Korean media, there are now TWO satellites in orbit broadcasting the “Song of General Kim il Sung” and the “Song of General Kin Jong il” at 27 MHz and 470 MHz. Too bad short wave radios are so rare in the DPRK. To date, however, no other country has verified the Kwangmyongsong No. 1 is in orbit–with one minor exception. That minor exception came from the Russian space agency which seems to have offered a temporary confirmation of the satellite (followed by a quick retraction) so the DPRK could assert that another country verified the satellite’s existence. The DPRK sent an artificial Earth Satellite into a low-Earth orbit on the morning of April 5. According to Russian aerospace monitoring data, the launch trajectory did not pass over the territory of the Russian Federation. The parameters of the satellite’s orbit are being specified. The DPRK had informed the Russian side ahead of time about the launch. We call on all concerned states to show restraint in judgments and action in the current situation and to proceed from objective data on the nature of the DPRK launch. We intend to watch further developments attentively, remaining in close touch and holding consultations with all concerned sides. Note that the above quote is from the Russian Foreign Ministry—not its space agency—and it is coupled with a call for political restraint. This is entirely a political statement, not a scientific acknowledgement of the satellite’s existence. Essentially, this quote asserts that for the purposes of public diplomacy, the Russian Foreign Ministry classifies this event as a satellite launch rather than a missile test. This follow up story in RIA Novosti is much more agnostic. Let’s see if 10 years from now reporting on the Kwangmyongsong No. 2 is any different. Meanwhile, we can all feel sorry for the people at KCNA who will now have to report on TWO satellites that do not exist. Experts speculate that impoverished North Korea spent at least US$30 million on development of a missile it is apparently poised to launch. While the North says it is launching a rocket to propel a satellite into orbit, many in the West are convinced this is in fact a Taepodong-2 long-range missile. When North Korea test-launched seven medium and long-range missiles in July 2006, South Korean military authorities estimated the total cost at about $63.69 million (about W60 billion according to the exchange rate at that time). Grand National Party spokesman Yoon Sang-hyun on Friday said his party estimates North Korea spent about $30 million test-launching the Taepodong-2 missile three years ago. “They should have spent the money to feed and clothe their people,” Yoon added. North Korea spent approximately $20 million test-firing the Taepodong-1 missile in 1998, and experts guess it cost more this time since performance and capabilities including the airframe and range of the Taepodong-2 missile have been improved by more than 10 percent since the rocket fizzled ignominiously in a test three years ago. These waypoints have been added to a Google Earth application which you may download here. UPDATE 3 (2009-3-15): Martyn Williams was kind enough to send me the NOTAM (Notice to Airmen) from Fukuoka (Japan) Air Traffic Control—posted below in full. The NOTAM provides the best estimate of the date and time of the launch. Download this .KMZ file (with additional closed air routes) to your Google Earth here. J0732/09 – ALL ACFT INTENDING TO FLY WI FUKUOKA FIR ARE ADVISED TO PAY SPECIAL ATTENTION TO THE FOLLOWING INFORMATION. A SATELLITE IS EXPECTED TO BE LAUNCHED FROM NORTH KOREA. The preparations for launching experimental communications satellite Kwangmyongsong-2 by means of delivery rocket Unha-2 are now making brisk headway at Tonghae Satellite Launching Ground in Hwadae County, North Hamgyong Province. When this satellite launch proves successful, the nation’s space science and technology will make another giant stride forward in building an economic power. The “Tonghae Satellite Launching Ground (TSLG)” is also known as the “Musudan-ri Launching Station.” TSLG is a new name, and today is the first time that KCNA has ever used it! The full KCNA story can be read here. Below you can find previous posts on the DPRK’s efforts to put a satellite into orbit—including information on the mysterious Kwangmyongsong-1. North Korea Intellectuals Solidarity (NKIS) reported on the 12th news from its source in North Hamkyung Province, which seemed to confirm the satellite theory; “The Kwangmyungsung-2, an artificial satellite, will be launched soon at the missile site in Moosudan-ri, Hwadae (county),” the source announced. According to the NKIS report, the Kwangmyungsung-2, allegedly a communications satellite, was developed by the Institute of Electronic War under the Academy of Sciences for Defense. If they go through with it, KCNA will have to report on two satellites that are not in orbit. “The DPRK’s (North Korea) policy of advancing to space for peaceful purposes is a justifiable aim that fits the global trend of the times. There is no power in the world that can stop it,” the newspaper said in an editorial. It noted that Iran on Monday successfully launched a satellite carried by a home-built rocket, setting alarm bells ringing among Western powers because of the implications for the range of its ballistic missiles. Rodong said North Korea had long been working on space research and development. Of course North Korea has used its purported space program as political cover for missle tests before. 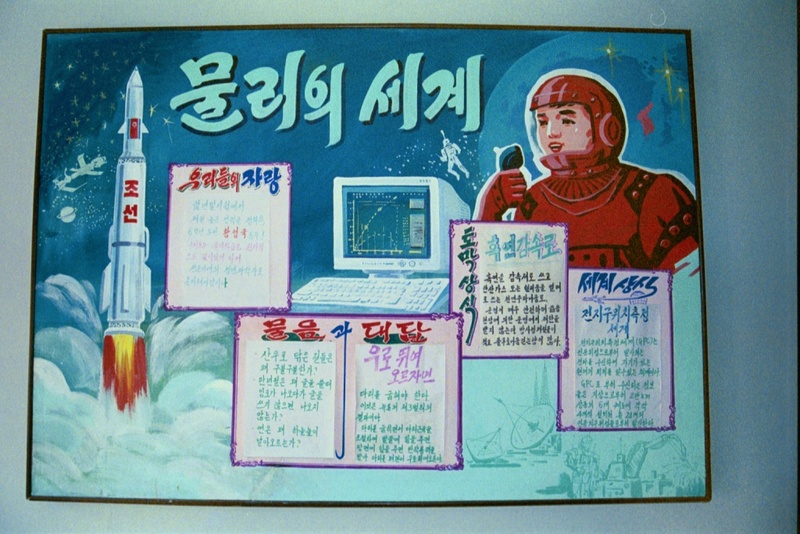 Back in 1998, Pyongyang informed the world about the successful launch of the “Kwangmyongsong No.1” satellite (which coincided with a previous round of missile tests). The satellite supposedly circles the earth playing the Song of General Kim il Sung. Although no one has been able to verify it is in orbit, as far as the North Korean people are aware the satellite is still circling the earth! KCNA just reported on it in January. 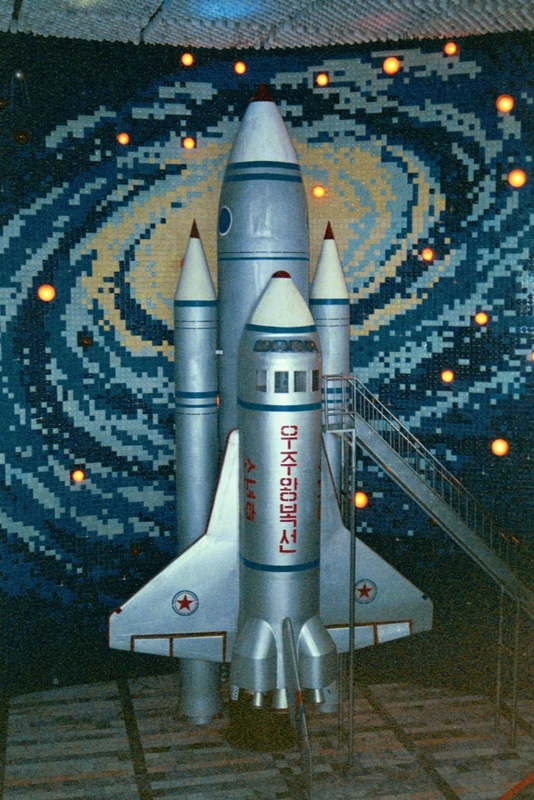 I should also point out that Pyongyang has consistently emphasized space travel as a policy goal in the mass games. See this photo at Pyongyang’s Moranbong Middle School and this photo in the Mangyongdae Children’s Palace. This entry was posted on Sunday, April 5th, 2009 at 8:00 am and is filed under Military, Rocket Tests, Unha 2. You can follow any responses to this entry through the RSS 2.0 feed. Both comments and pings are currently closed. I read the North Koreans have never been informed that men have walked on the moon. They probably haven’t seen any images of the American space shuttle either, other than that model. Yeah you know JonG, How i wish that N.Korea had a spaceship. JonG, though i believe in your claim that NKs haven’t been informed of men walking on the moon, I would like to read it myself… Where can I find this article?